FDA-regulated organizations seek to deliver ground-breaking products which enhance the well-being of their customers. In the course of product development, however, compliance becomes the driving factor and, in turn, a development distraction. In our view, compliance, and the associated documentation, is instead an outcome of a streamlined process that ensures teams deliver safe, reliable products to market. Organizations must define processes around development and production, and detail traceability from the high-level user needs, to system requirements, to validation and verification protocols, to clinical trials, and to user and market feedback. Achieving compliance, and creating the documentation, is an outcome of the focus and rigor required for regulated product development. Every company that produces medical devices has to plan for when they must present compliance evidence to the FDA auditor. The most difficult and time-consuming part of this? Sorting through the available documentation produced by the design and development team, including outputs from multiple software tools. Even in the best-case scenario, assembling and delivering documentation that is comprehensive in its demonstration of the product life cycle is an arduous task. When auditors review the design and development of your medical device, they want to understand the full story, from the original concept though post-production. They want to see every angle: how you’ve examined your product (including internal action items and decisions), how you’ve incorporated market feedback, and how you’ve analyzed safety of similar products. Within that story, auditors want proof that you’ve taken action to ensure that risks that can’t be eliminated fall into an acceptable range. Everyone, including the auditor, wants the audit process to run smoothly to ensure the safety of the patient. So how can you easily produce comprehensive documentation and pass your compliance audit? Maintaining compliance requires a solution that enables or automates process improvements, so teams can focus on the work that really matters—getting the product right. Jama is software for better, faster requirements definition, management, verification and validation. With Jama configured to your workflows and best practices, teams are empowered to spend more time developing products and less time managing compliance without worrying that a critical piece of information is missing during an audit. 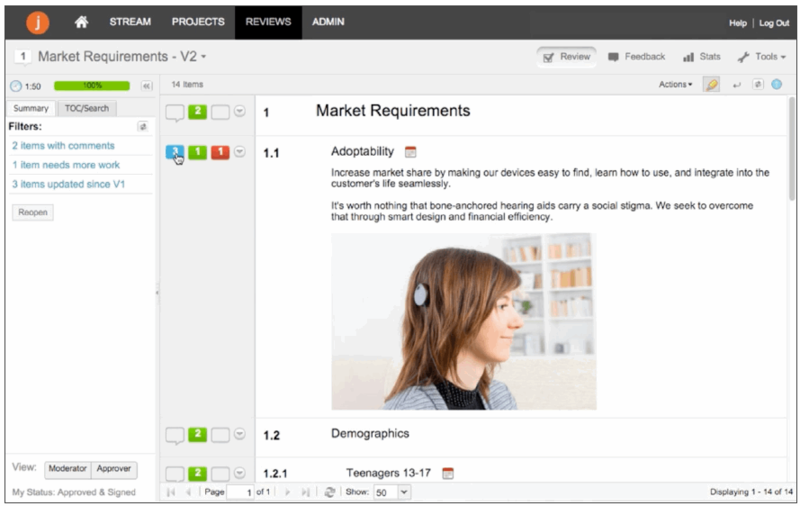 We recommend that you manage all design controls (user needs, requirements, risks, design specifications and tests) in Jama, and synchronize data from other developer tools, such as JIRA, using the Jama Integrations Hub. This setup will provide end-to-end traceability, and also ensure that all of your data is available for your audit documentation. 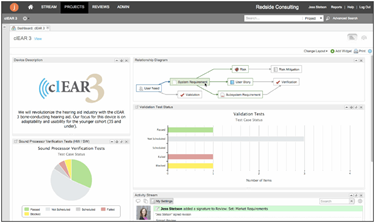 Just as you manage design controls with Jama’s collaboration tools, you can also use Jama to execute your risk management process. This provides the team one area where they can go to document risks and traceability to design controls. Jama also reinforces the organizational processes you have defined, ensuring that if and when an audit does occur, you are confident that you have the right information available. Through our work with medical device companies, we have recognized risk management best practices for using Jama in your development process. These techniques provide full traceability between risks and design controls, streamlining your compliance process and improving product quality. To start, we suggest you track risks as individual items. Complete a preliminary estimate of the risk by defining the probability of occurrence of the harm and the severity of that harm, and use the calculated risk priority number to assess if the risk is acceptable. As you define mitigations, use relationships to illustrate those in Jama, and then update the risk priority number post-mitigation. Use the Jama Review Center for both risk and design control reviews, inviting feedback from subject matter experts and stakeholders. When someone asks why a risk was estimated a certain way, these reviews provide a self-serve answer. With the Jama Review Center, and data in the project space, teams can collaborate on risk definition (and add more as risks arise), and discuss mitigation plans and verification of test results, to collaborate on solutions and to finalize and document decisions. When telling the story of your medical device’s development life cycle to the FDA, it can be a struggle to organize the information in a cohesive manner. And if there are information gaps, or decisions and action items aren’t recorded, these gaps could result in your product never reaching the market—or being pulled from the shelves. Using Jama creates much of the needed evidence and is an easy step to take that will save time and money in the long run. Get real-time feedback in Jama Review Center to shorten milestone phases and document decisions. Check out this video to understand more about how Jama helps medical device manufacturers manage risk. 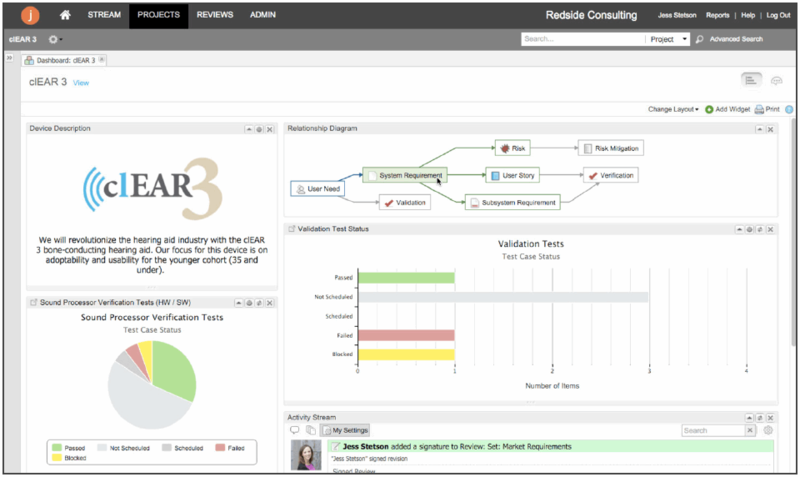 And if you’re ready to see how Jama can help you manage the development of your medical device programs, start a free trial.